As you can see, I received 10,000 servings of Fettucini Alfredo and 10,000 servings of Edamame as a gift from my Cafe World neighbors. This means tons of money! 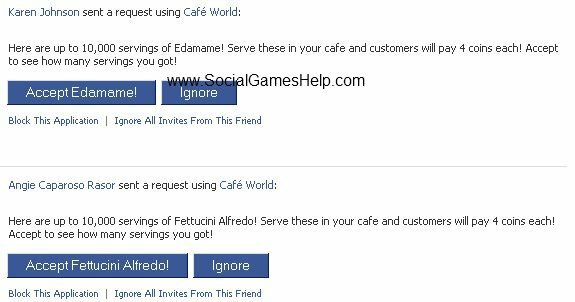 Unfortunately, this Cafe World bug doesn't really give you 10,000 servings of each dish as a gift from your neighbors. Instead, I received 10 Fettucini servings and 75 Edamame. Which is still nice, but certainly doesn't beat 10,000. However, this leaves me wondering: might Zynga be working on an increase of giftable servings? Or is 200 enough already? What do you think? This article originally appeared on Social Games Help.